Click here for Race day photos! 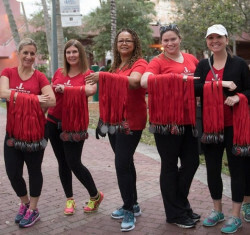 Lace up your sneakers and join us for the 19th Annual Riverwalk Run at Huizenga Plaza on Saturday, April 6, 2019. Hosted by the Junior League of Greater Fort Lauderdale, this event raises funds to help members of the Junior League of Greater Fort Lauderdale continue improving the surrounding community. The Riverwalk Run is a day of fitness and fun for the whole family as well as serious runners. All fitness levels are encouraged to attend! Options include running the 5 mile USATF Certified Course or the 5K course. A seperate 5K Fitness walk is perfect for those who wish to take a slower pace. Once again, the "Kids Fun Run" will offer a 1K course lined with parents and volunteers to cheer them on. Post-race festivites include a brunch with local vendors, activities for kids, and an awards ceremony for top race finishers. All registrants will receive participation medals. Do you have a Furry Friend who would like to tag along? Friend, well-behaved dogs are welcome. Just be sure to sign them up, and don't forget a leash! **Serious Runners: Staggered starts for each participating category will be in place. Childhood fitness and nutrition, and more! The 19th annual Riverwalk Run will take place on Saturday, April 6, 2019 at 8:00am. You can register ONLINE or in person on the day of the Riverwalk Run beginning at 6:45am. Accepted forms of payment include cash, check, Master Card, Visa and American Express. Riverwalk Run will take place at Huizenga Plaza, located at 32 East Las Olas Boulevard in downtown Fort Lauderdale. The picturesque route starts at Huizenga Plaza on Las Olas Boulevard, and then curves along the bank of the New River, wandering through the tree-lined neighborhood streets of Rio Vista, cutting through Smoker Park with views of the New River and the historic Stranahan House before finishing on the signature brick path of the Riverwalk. All participants will receive a unique, newly designed, participation medal! *Special team pricing will be available for groups of six (6) or more. If you are a company, or simply have a group of friends who want to participate in Riverwalk Run, we’d love for you to join us! Special pricing and registration instructions will be available. IMPORTANT: Anyone who registers after Friday, March 29, must pick up their race bibs (and shirts) on race day. Early packet pick up will not be available to anyone who registers after Macrh 29. Wednesday, April 3: 12 p.m.- 6 p.m.
Thursday, April 4: 12 p.m.- 6 p.m. The Riverwalk Run is a timed event. Timing and scoring will be provided by Split Second Timing, an accredited organization. From I-95: Take the Broward Blvd Exit. Go East on Broward Blvd. Turn right onto Andrews Avenue. Turn Left onto East Las Olas Blvd. Huizenga Plaza is on the right. From US-1: Turn West onto Broward Blvd. Turn left onto Andrews Avenue. Turn Left onto East Las Olas Blvd. Huizenga Plaza is on the right. Public parking is available by the hour in two large garages across the street from Huizenga Plaza. Volunteers are an essential part of Riverwalk Run – from cheering on runners along the course to helping with the brunch, every volunteer is an important part of our event. If you would like to join Riverwalk Run by volunteering, please contact us! 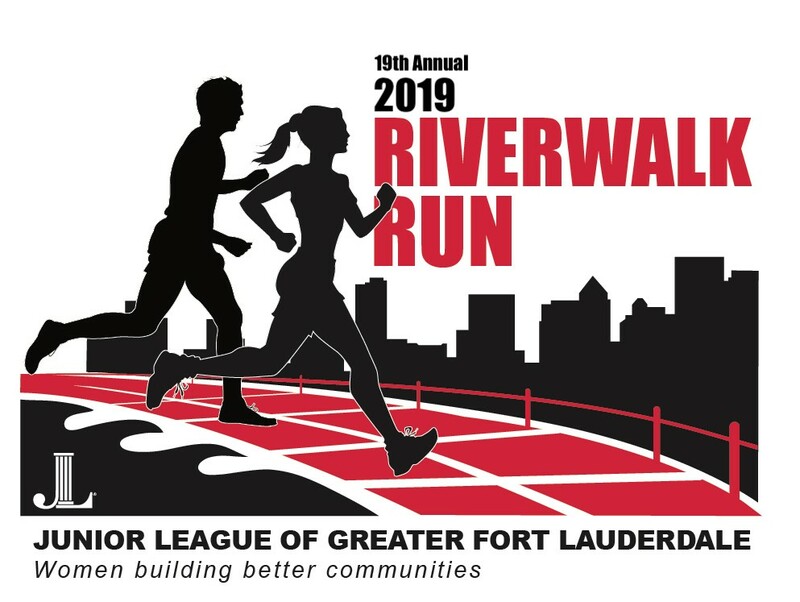 If you would be willing to donate to support the Riverwalk Run or would like more information, please contact the event chairs – Christina Jolley or Jacqueline Costoya at the email address below or by calling (954) 247-4551. 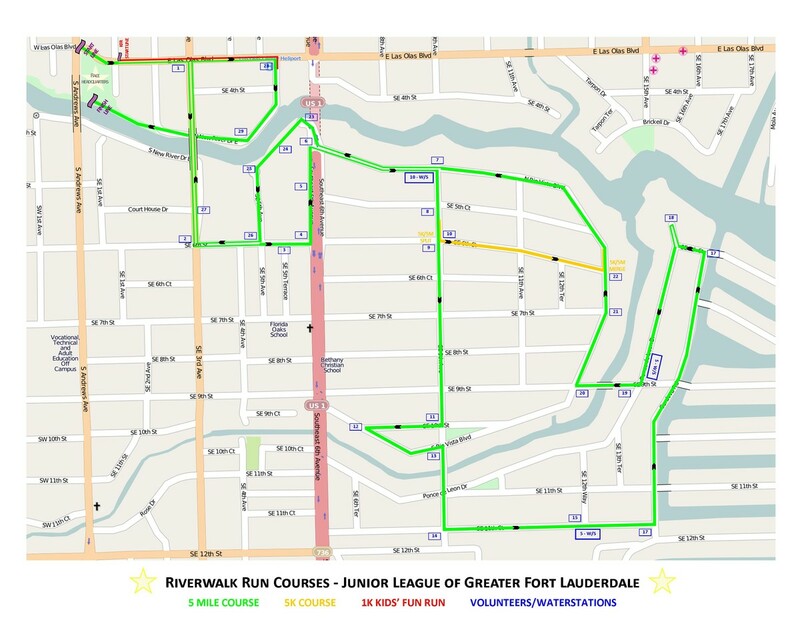 The Junior League of Greater Fort Lauderdale, Inc. is a non-profit 501c3 organization. The all-volunteer membership is made up of women who are committed to promoting voluntarism, developing the potential of women, and improving the community through effective action and leadership of trained volunteers. Our purpose is exclusively educational and charitable, and its members work tirelessly to support important community causes impacting women and children throughout Broward County.